Does God care about truth? Clearly, the answer is yes, for the words He speaks are truth itself (John 14:6). Is God concerned with goodness? How could he not be, since “no one is good except God alone”? (Mark 10:18). Does God love beauty? I suspect that most of us would answer, “yes,” but do we really believe it? Do we design worship with beauty in mind? Do we look at writing music, telling stories, and sculpting and painting as callings? How often do we think about promoting beauty in the culture and adorning all that we do with what is beautiful? Such questions are important because it is easy for us to lose sight of the extent to which God prizes beauty. Sinclair Ferguson, Nathan Clark George, Andrew Peterson, and R.C. 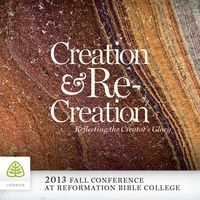 Sproul considering the theme “Creation and Re-creation: Reflecting the Creator’s Glory” focusing on God’s call to work for beauty in all of life and reflect the glory of the Lord, who “has made everything beautiful in its time” (Eccl. 3:11).